Miriam’s family should be rich. After all, her grandfather was the co-creator of smash-hit comics series The TomorrowMen. But he sold his rights to the series to his co-creator in the 1960s for practically nothing, and now that’s what Miriam has: practically nothing. And practically nothing to look forward to either-how can she afford college when her family can barely keep a roof above their heads? As if she didn’t have enough to worry about, Miriam’s life gets much more complicated when a cute boy shows up in town… and turns out to be the grandson of the man who defrauded Miriam’s grandfather, and heir to the TomorrowMen fortune. 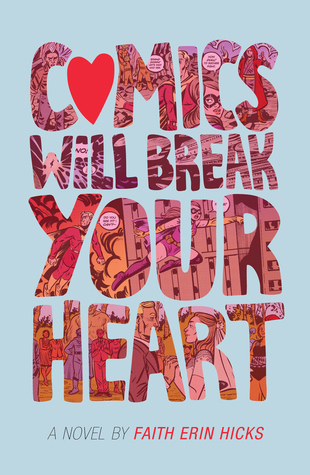 Comic and graphic novel writer Faith Erin Hicks makes her debut in young adult fiction with Comics Will Break Your Heart, and does it beautifully! In this sweet YA novel, two teens from families with a long-standing grudge meet and connect one summer in Nova Scotia. Miriam’s grandfather co-created the TomorrowMen comics with Weldon’s grandfather, but sold his rights to the brand for only $900 many decades earlier. Since then, TomorrowMen has blown up with a huge fandom and a blockbuster movie in the works, and while Weldon’s family stands to profit hugely, Miriam’s will see not a dime, despite the 20-year lawsuit waged by her grandfather to undo the shoddy deal he unwittingly agreed to. When Miriam and Weldon meet, they each carry their families’ baggage, but their mutual love of comics as well as their own personal struggles to figure out their futures draw them together and help them move past the animosity that’s lingered for so long. This is a quick, fun read, with touching moments too, and has some lovely scenes that highlight the intricacies and quirks of best friendships, relationships between teens and their parents, and the heartaches and worries that come with making decisions about where to go in life. In a flash he saw everything as she saw it, the madness and energy but also the joyful heart of the convention. For more by this author, check out my reviews of two of her graphic novels, Friends With Boys and The Adventures of Superhero Girl. Captivating and boldly imaginative, with a tale of sisterhood at its heart, Rena Rossner’s debut fantasy invites you to enter a world filled with magic, folklore, and the dangers of the woods. 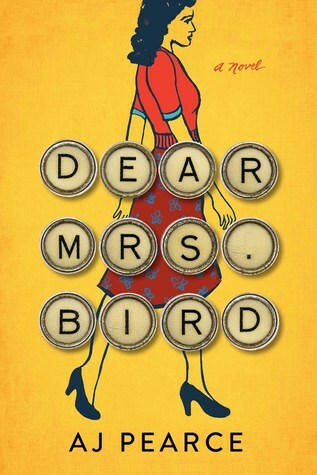 What a lovely and unusual debut novel! Author Rena Rossner draws from folktales, fairy tales, and Jewish history and traditions to create an entrancing story of two sisters whose lives are informed by magic, yet who are deeply rooted among the Jewish villagers in the small town of Dubossary (located in modern-day Moldova). Liba and Laya are very different — Liba, the elder, is 17 years old, with wild, dark hair and a rounded body. She loves to study with her father, learning Torah and Talmud and all sorts of scholarly Jewish subjects not considered fit for girls. Laya, the younger, is 15 years old, with white-blond silky hair, pale skin, and a lithe figure. She has no interest in studies, but prefers to dream in the sun, alongside their beautiful mother. The girls’ parents are semi-outcasts. While the father was descended from a respectable, revered Chassidic family, the mother is a non-Jew who converted to Judaism when she married the man she loved, yet the neighbors have never ceased to gossip and consider her an outsider. When the parents are called away for a family emergency, the girls are left home alone in their small cabin at the edge of the forest, and immediately, strange things begin to happen around them. A group of brothers come to town and set up their fruit stall, selling exotic, exquisite out-of-season fruits that the townspeople can’t resist — and beguiling the young women of the village with their impossible good looks and flirtatious, wild demeanors. Liba and Laya have been told secrets by their parents about their own true identities, and each begins to experience her own set of changes — physical and emotional — as she grows into womanhood. Meanwhile, there are rumors in the village of violence coming closer, as anti-Semitism rears its ugly head and pogroms begin to devastate Jewish communities across Russia. Dubossary has always been different, with Jews and Christians living in harmony, but when a beautiful Christian girl is found murdered in a Jewish family’s orchard, unrest, evil whispers, and soon real danger threatens the Jewish people of the town. If the plot sounds a little jam-packed — well, it is. There’s a lot going on here, with Liba and Laya’s secrets and struggles, the mysterious fruitsellers and their addictive wares, the rising anti-Semitism, and the dynamics of Chassidic dynasties as well. Beyond plot, though, there are also so many little touches of loveliness. The book is filled with Yiddish, Hebrew, and Russian expressions (with a handy glossary at the end) that give the story an authentic, rich cadence. Likewise, the flavors and textures of this world come to life through the descriptions of the foods (borscht, mandelbrot, kugel, and more), the flowers and plants, the wildlife, and the natural beauty of the snow, the river, and the forest. Each girl has her own voice, as we hear in alternating chapters. Liba’s chapters are in prose, and Laya’s are in verse. Each is compelling, and while Liba’s chapters are much more action-packed and immediate, Laya’s have a lightness that’s quite beautiful to read. When moonlight sets itself high in the sky. Naturally, between the setting and the introduction of folktale elements, I was reminded of Katherine Arden’s excellent The Bear and the Nightingale, although the stories are very, very different. 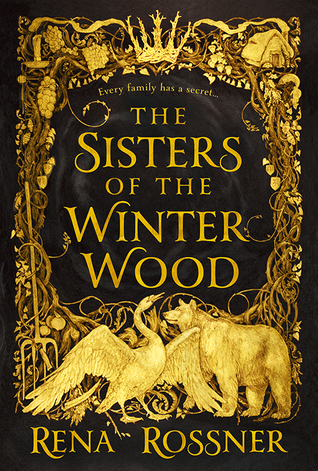 Fans of that book should definitely check out The Sisters of the Winter Wood. It’s a magical story filled with beauty and awfulness, balancing real and fantasy worlds, and above all celebrating the love between two devoted sisters and the sacrifices they make for one another. Highly recommended! 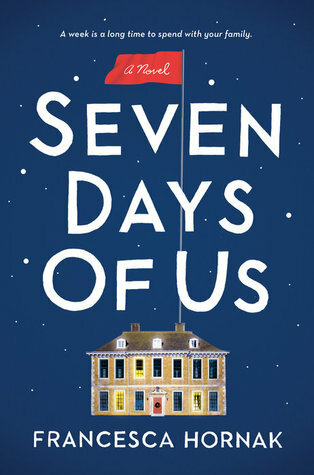 Seven Days of Us is an entertaining, quick read about a family forced into isolation together — a perfect setting for secrets to emerge and for walls to come down. Phoebe and Olivia rediscover the sisterly affection that’s been absent since childhood; Andrew and Olivia finally come to understand one another’s obsessions and sacrifices; Emma and Andrew confront the iciness that’s taken hold in their marriage. Meanwhile, Phoebe’s fiancé crashes the quarantine, as does an American who ends up being the long-lost illegitimate son Andrew never knew he had. The story moves along at a smart pace, with each character getting bits and pieces of the story. The main chapters focus on the seven days of quarantine, while within each day, there are sections devoted to the different characters, each section showing the time and the location within the house — which lends the narrative a claustrophobic air that’s appropriate for the involuntary intimacy and close quarters experienced by the family. I do wish the author had included some sort of introduction explaining the quarantine rules. Why would a doctor treating epidemic patients be allowed back into England, passing through a major aiport, in order to go into quarantine with her family? Is this a normal protocol? Sure, readers could Google it, but it would have been helpful to have a bit of context, considering that this is the major plot driver of the entire book. My interest never flagged, but certain plot developments (no spoilers here!) 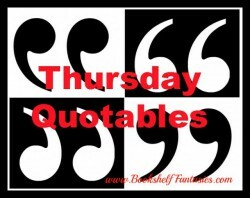 were completely obvious, and a tragic turn toward the end of the book seemed both jarring and unnecessary. Overall, I recommend Seven Days of Us. 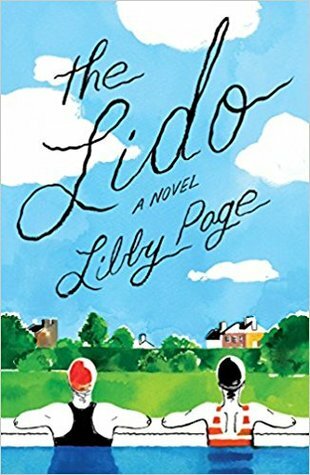 It’s a pleasant, amusing story of family dynamics, and the ups and downs of the relationships between parents and children, between siblings, and between spouses definitely ring true. With many thanks to Goodreads — I won this in a giveaway! Good Me, Bad Me is an intense first-person visit inside the mind of a troubled teen. Milly is struggling to figure out who she really is: Can she live a normal life after 15 years with a psychopathic murderer for a mother? Does she truly have a shot at being good? Milly’s story starts when she turns in her mother after the 9th in a long series of child murders. On the outside, her mother wears a kind and lovely public face, working at a women’s shelter, providing care and comfort to desperate women and their children. In reality, though, she’s an expert at gaining people’s trust, never letting them see below to the hellish, sadistic creature underneath. Milly (whose real name is Annie) has been living alone with her mother since age 4, when her father left and took her older brother with him. Since then, Milly has been both horribly abused and victimized herself, and forced to watch (and sometimes participate) as her mother abducted, tortured, and murdered young children. Finally free, with her mother behind bars, Milly is taken in by a foster family. Her foster father Mike is also the psychologist who works with Milly to prepare her for her mother’s trial, where she’ll be the star witness, but the home life isn’t all rosy. Saskia, the mother, is a mentally unstable coke addict who’s physically present but emotionally absent. Most problematic for Milly is Phoebe, Mike and Saskia’s teen daughter, who emphatically does not want another foster kid in the house, resents the attention Milly absorbs, and sets out to bully and harass Milly at every turn, especially at school, away from her parents’ eyes. We see everything from Milly’s point of view — and inside Milly’s head isn’t a very comfortable place to be. Milly’s narrative of events is continuously peppered with 2nd person comments, as she maintains a one-way dialogue with her mother — the “you” who fills Milly’s thoughts and to whom Milly is constantly trying to justify herself. She doesn’t want to be like her mother, but the darkness keeps threatening to engulf her. We see her struggle to find a place for herself and be normal –but there are also lapses, incidents where Milly lets her inner demons take over as she engages in behaviors that are questionable, at best. Like Milly, we never see the mother directly over the course of the book’s action. The closest Milly comes is when she testifies in her mother’s trial, during which she’s sheltered from viewing her mother by a screen. She knows she’s there, can sense her presence, but never actually sees her — and this holds true for the reader as well. Milly’s mother’s presence is a constant, even though we never see her directly. Between Milly’s inner dialogue with her mother and her nightmares about her, we feel her shadow over every scene. I did have a few minor quibbles with the plot and the narrative. While we get enough information over the course of the book to get the basic idea of what Milly’s mother did over all those years and how Milly was victimized, we don’t see any of it directly. I’m not looking to wallow in the muck here, but there’s a bit of vagueness that started to irritate me after a while. A few more details would have been helpful about Milly’s earlier life — did none of her teachers over the years ever notice anything off about this poor abused child? Her scars may not have been visible, but surely some professional might have noticed her emotional damage? I question too the lack of proper attention Milly received after her mother’s arrest. Mike represents a huge problem for me — he’s her foster parent, and is supposed to care for her, yet is also her court-sanctioned psychologist and is secretly writing a book about her. After all of the years of suffering, it would seem to me that Milly needs much more than she’s given, and the assumption that she can live a normal life with just weekly therapy seems terribly misguided. Without giving too much away, it’s clear that this is not a good foster placement for Milly, but if Mike is the only one providing her mental health care, there’s no way for the situation to improve. Your voice in my head. THAT’S MY GIRL, YOU SHOW THEM. THANKFUL NOW, YOU SHOULD BE, FOR THE LESSONS I TAUGHT YOU, ANNIE. Your praise, so rare, when it comes, rips through me like a bush fire swallowing houses and tress, and other teenage girls who are less strong, in its hot, hungry mouth. I meet their stares, the remnants of Izzy’s gum hanging off my chin. Thrown by my defiance, they are, I see it. Fleeting. The twitch around their succulent lips, eyes slightly wider. I shake my head, slow and deliberate. Izzy, the hungrier of the two, takes the bait. 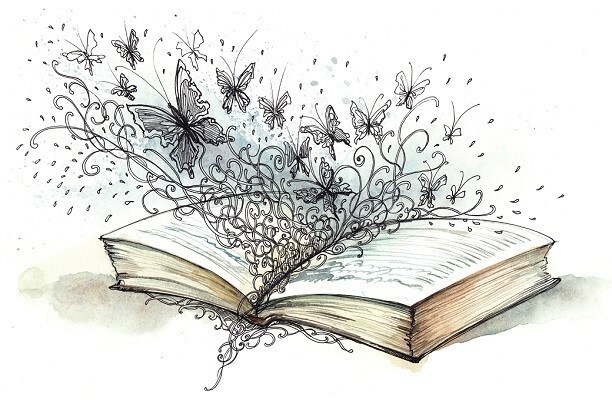 The book builds to a climax that was not at all what I’d expected. It’s disturbing but makes sense, and left me with a huge sense of unease — which is a sign that this thriller accomplished what it set out to do. 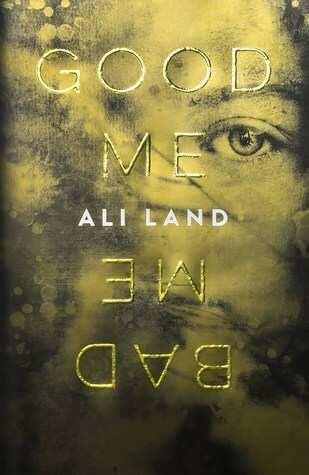 Good Me, Bad Me is a tense, suspenseful read that I really couldn’t put down or get out of my thoughts. The inner life of a damaged soul is not a pleasant thing to see. Definitely check out this book if you like psychological depths and twists, but be prepared for sleepless nights. When Raquelita Muro and Matthew Buchanan meet by chance on a Greyhound bus between Texas and Tallahassee, neither suspects Fate is about to take over. Raquelita, a gentle girl under the heel of her abusive mother, finds this kind young man a miracle. Matthew, an idealistic young soldier, discovers this sweet-natured girl is an angel in need of a guardian. However, the next stop on Matthew’s journey is Fort Benning to report for deployment to Vietnam, while Raquelita’s destination is set at her mother’s whim. Regardless of the forces tearing them apart, they discover a way to secretly span the distance, to end up closer than ever. But Fate is rarely kind. The vagaries of war—and the unstable tempers of Raquelita’s mother—intervene, leaving both ill-fated lovers feeling there is no hope for their love. Set in the turbulent era of the Vietnam War, Raquelita’s and Matthew’s story is one of love, loss, lost faith, shattered memories, deferred dreams and broken promises. Will Fate tear apart these two damaged souls, leaving them desperately alone forever, or will they finally overcome Fate, their bond stronger than they ever thought possible? Debut author Victoria Saccenti has written a complex, heart-wrenching tale of a chance meeting that changes lives, and the intricate ways that bonds of family and obligation can both hurt and heal. The love story here is startlingly sudden, but also quite sweet, as Raquelita and Matthew recognize their connection within moments of meeting and somehow manage to establish a bond so strong that it can withstand physical and emotional trauma. 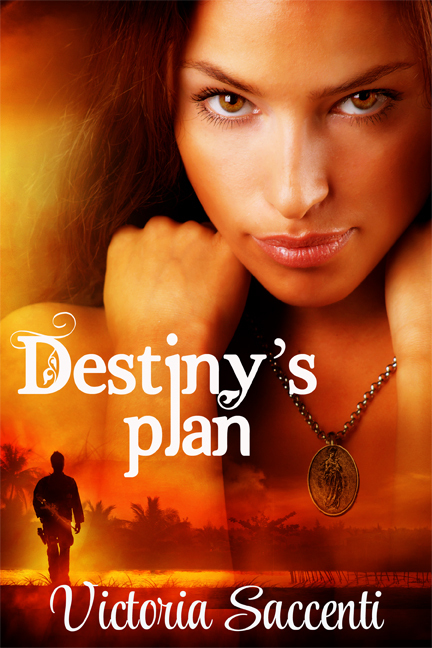 Destiny’s Plan has a plot that spans eras and continents, as the author weaves in not only the Vietnam War but also goes back to an important family episode during the Spanish Civil War. The author has clearly done her research, as the historical elements are well presented. Not only do we get the facts of a deployment to Vietnam and what that might look like, but we also get the sights and sounds of the late 1960s through the inclusion of the music, fashion, and political and social upheavals of the time. Raquelita’s life is hard and complicated. One of the pieces of the story that I most enjoyed was getting to know the members of her family, from her damaged and cruel mother Isabel to her mysterious godfather Xavi, her loving father Emilio, and the aunt, uncle and cousin who give Raquelita a chance to experience a normal, loving home life. Raquelita’s younger sister Marité is adorable, and I understand she’ll be the central figure in her own book next. Another element that really appealed to me in Destiny’s Plan was the fact that love is shown in different ages and stages in this book. Yes, Raquelita and Matthew are the main characters and love story, but we also see several more mature adult relationships as well, and it’s both unusual and refreshing to see true love, emotional and physical, shown as not only the territory of the younger generation. 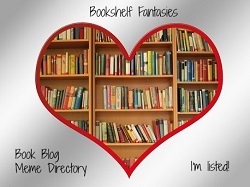 A slight disclaimer: I’m not usually a romance reader, and so I don’t have much in the way of comparison. I have a feeling that the plot elements that didn’t really work for me in this book are probably things that would appeal to someone who enjoys romances — but as this is not a preferred genre for me, I had to push myself a bit to get over it. Likewise, I was a bit taken aback by the many explicitly intimate scenes, but again, I think I just generally don’t read romances and didn’t know what to expect. Overall, I’d say the time period gives this book an interesting and unusual flavor, and the characters are well-developed and memorable. If you enjoy swooningly romantic stories with underlying drama and painful obstacles, check out Destiny’s Plan! To learn more about the author, check out my spotlight post here.